A faceted metal ceiling will be one of the main features of gold mining firm LSA’s new office fit-out, at Brisbane’s 400 George Street address. The 3,000 sqm design, by Group GSA, uses natural materials and enlarged graphics to convey the company’s philosophy. Interiors principal, Lisa King, said the vision created a cost-effective, sophisticated and understated fit-out that would stand the test of time — an important point, given that LSA have signed a 10 year lease. “Our design subtly highlights the core operations of the company through the use of natural elements including stone and timber in the reception area as well as key features such as the faceted reception ceiling, reminiscent of the mining processes effect on stone,” King said. 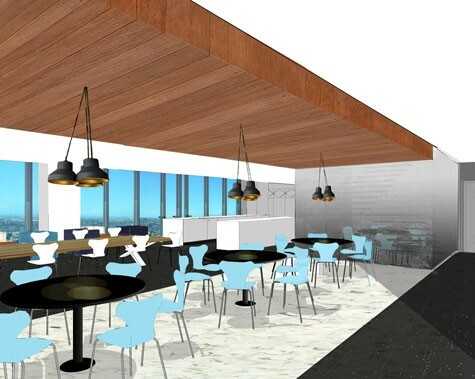 Having moved from its former premises at 500 Queen Street, the new office will incorporate a more open plan and flexible office concept, featuring a light-filled staff cafe and approximately 20 offices over two levels linked by an interconnecting staircase. “We have made the most of the expansive views of the premises, making them as accessible to as many staff as possible,” King added. LSA executive general manager, Tim Fry, said the interior design of its new 400 George premises was critical in meeting the company’s future requirements. “We are looking forward to having a presence in one of the most progressive and environmentally-sensitive new commercial precincts in Brisbane,” he said. Construction of the new office fit-out is expected to begin in late January with LSA expected to move in by April 2010.